Today the Most Rev. Steven Raica was ordained and installed as the fifth bishop of Gaylord, Michigan. the tree and sun allude to the places from which his family came and the red crown is symbolic of his patron, the martyr, St. Stephen. This entry was posted in Bishops on August 28, 2014 by guyselvester. A wonderful coats of arms! Simple and with personal symbols instead of only un-personal general charges. I recognize here the designer who also created the coats of arms of f.i. mgrs. Kemme (Wichita) and Molloy (Rockford) and many others. But what is his name? Up to me an excellent heraldist. His heraldic autograph is perhaps the bishops cross with four clover-ends and five red jewels ( five wound of Christ). I see it as many as the cross potent in Sullivan-arms. Only remark: Traditionally in a divided shield a border does not run along the partition-line with the sinister (personal) half but only along the three edges of the shield. When the sinister field would mainly contain a color, I could imagine that the border in the dexter half would run along the partition-line but here I saw no reason to break the tradition. We see now here (and in the shield of predecessor Hebda) a silver border running along a golden field in the sinister half: not incorrect but perhaps unneccesary. I don’t know who the artist is. I must say that traditionally, heraldic artists didn’t sign their work. I also agree about the bordure in the impalement of the arms of the see. It really should only be shown on three sides and not along the side of the impalement. perhaps this indicates a lack of complete heraldic knowledge on the part of the designer? No, artists don’t “sign” their work, but many of them develop a very personal style from which you can read them. A good example is deacon Sullivan whose crosses are quite potent and his scrolls are forked and with red edges. I have of course my own style, but I always try to copy such a cross in my own drawings so that I can in my archive “read” the artist. I loved the style of Heim and this was for my an eye-opener for the way I make my pictures (see araldicavaticana); SIMPLICITY! 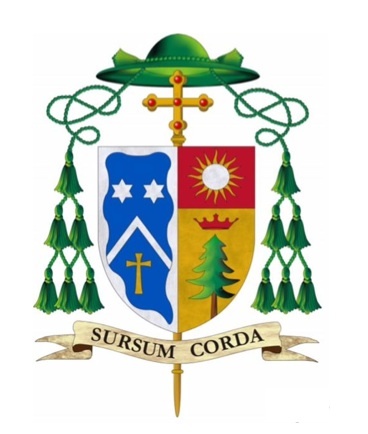 But on the contrary: when a bishop askes me to design his coats of arms I always ask him for their official picture: “What shape of cross do you want? Do you wish jewels or not? And: Such a cross has NO meaning others then ‘I am a bishop / archbishop”. I don’t agree with Noonan in this matters. Hola! Creo que el artista heráldico se llama Renato Poletti, en estos dos sitios web es mencionado. Es increíble el gran numero de escudos que ha diseñado para obispos de todo el mundo, en especial a italianos. Sus obras suelen tener una cruz procesional con 5 gemas rojas, en referencia a las 5 heridas de Cristo, y la estrella siempre es de 7 puntas. Algunos escudos tienen firma. Online translation: Hello! I think the heraldic artist called Renato Poletti, these two websites is mentioned. 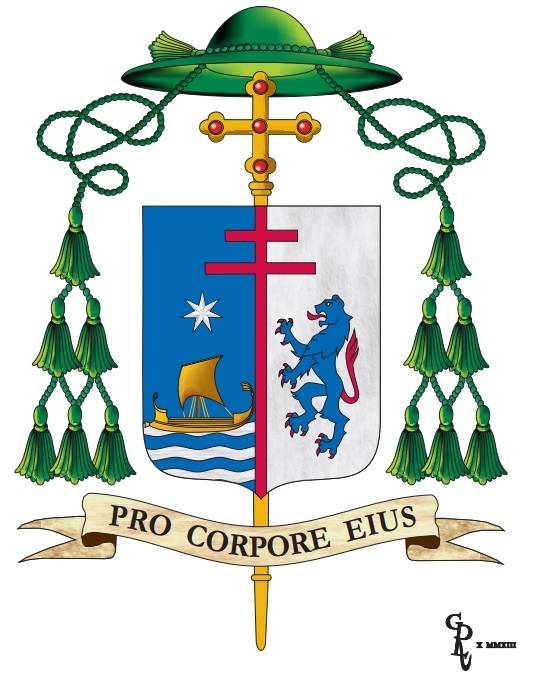 It’s amazing the great number of shields designed for bishops around the world, especially to Italians. His works often have a processional cross with 5 red gems, in reference to the 5 wounds of Christ, and the star is always 7 points. Some shields have signature.